If you’ve been a homebrewer or beer fan for any time at all, you will no doubt have enjoyed a fair number of unusual styles. Some commercial breweries have staked their claim on the premise of brewing well outside the box of the traditional style. Homebrewers are no less imaginative and adventurous in a quest to make their own personalized concoctions. 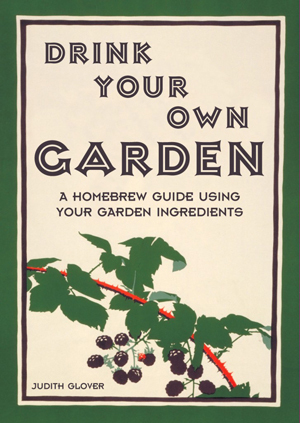 If you are inclined to do so, then you might give a proper look to Drink Your Own Garden: A Homebrew Guide Using Your Garden Ingredients (Batsford, Hardcover, $19.95, 256 pp), a homey and compact book that offers a unique slant on brewing from Judith Glover’s diverse horticultural and artistic perspective. This is not a book for beer brewers specifically, but one for those who see creative potable potential in all things fragrant and/or edible. Glover’s breadth of imagination and knowledge is quite impressive, her fascination with and passion for both cultivated and wild plants a medium with which to express her culinary art. Winemakers especially, but also gardeners, foragers and mead makers, will find Glover’s book to be an inspirational resource for crafting small batches of wine, mead, juices, teas and cordials. Brewers will find only a few rudimentary beer recipes. There is, however, information aplenty elsewhere in the book that could be easily be incorporated into a fruit, vegetable or botanical beer. As an avid gardener, brewer, fermentationist, naturalist and tinkerer myself, I was able to find many pleasant surprises between the covers to set my wheels turning. Drink Your Own Garden dedicates the first 36 pages to the pragmatic aspects of basic brewing and fermentation, from equipment to methodology to troubleshooting, much of which may be redundant to homebrewers. But perhaps it’s not familiar to someone interested in delving into the hobby with these easy, small batches. The methods section is quite thorough, yet not overwhelmingly technical, a plus for the dabblers and greenhorns. One particularly nice feature is the seasonal calendar that outlines the availability of the ingredients in her recipes and the optimal time to find and use them during peak condition. The bulk of the book is dedicated to recipes, over 140 of them, all of which are neatly organized into eight chapters. Seven pertain to wine, and one is for mead, beer and unfermented beverages, collectively. Individual wine chapters include berry and bush, flower, fruit, grain, herb, leaf and sap, and vegetable recipes. The flower, herb and leaf and sap sections contain some fairly obscure and unexpected ingredient suggestions, some of which might even provide a bit of crossover inspiration for more serious beer and mead makers. All recipes are scaled to one gallon (U.S., Imperial and metric), though there is no reason that any of them can’t be adapted to larger volumes. Judith Glover’s book is a modest, homespun nod—complete with old-timey, retro seed and plant ads, illustrations and plates—to those who love to brew and also have a keen interest in something decidedly more esoteric. One would not need to have any extensive brewing knowledge or experience to enjoy the pleasures of these rather simple instructions and recipes, only a desire to broaden the utility of the bounty or use otherwise overlooked botanicals and produce to cultivate something entirely with their own hands and to their own whims. I can certainly appreciate her angle and expertise; perhaps you can, too.